Japanese Episode DP 154: "The Air Battle Master Enters! Glion vs. Hassamu!!" American Episode 1249: "Mastering Current Events!" As Satoshi and his friends try to find their way to Asatsuki Town, they stumble across a valley. There, they witness an aerial battle between an air battle master named Mitsuzoh and his granddaughter, Mayo. Satoshi's Glion watches the battle and decides that it wants a try, so a match between Mitsuzoh's Hassamu and Satoshi's Glion is arranged. After the short bout, it becomes clear that Glion is no match for the air battle master's pokemon. Later that night, Satoshi stays up with his pokemon to help it learn how to "read the wind." The next day, the young trainer solicits another battle from Mitsuzoh, promising that his pokemon has made progress. Mitsuzoh accepts, and the two pokemon take to the skies again. This time, Glion surprises the air battle master by being able to dodge Hassamu's attacks. As the battle continues, Glion learns a new technique, Giga Impact, and is even able to hit Mitsuzoh's untouchable pokemon. Though Glion had shown a substantial amount of progress, Hassamu is still able to emerge victorious. Later, Mitsuzoh expresses his surprise at Glion's ability to improve so much in such a short time and asks Satoshi if he'd be willing to let him train it. After consulting it with his pokemon, Satoshi agrees and leaves Glion in Mitsuzoh's care. As Satoshi bids a farewell to his friend, he tells it that he'll look forward to the day they can meet again. This episode was alright, I guess. It wasn't the best episode ever, but it was entertaining enough. We've seen trainers setting up camp out in the middle of nowhere before, so the basic premise of this episode is familiar territory. The thing this episode does that the others don't is incorporate this whole thing about "reading the wind" into Satoshi's training. It's a pretty interesting idea to have Satoshi struggle with, and then eventually overcome, the problem that wind can cause in aerial battle, and I thought they did a decent job with that overall. Of course, he won't use any of the experience he gains in this episode ever again, but that's just how this show is sometimes. This one also stands out because of Glion's departure, but I really don't feel like it's too different from every other release this show's ever done. 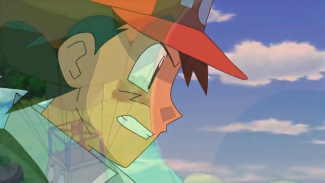 Episode focuses on a pokemon, said pokemon overcomes some problem, someone offers to take it off Satoshi's hands, there's a montage, it agrees, and then everyone walks off into the sunset. Lather, rinse, repeat. The only thing I can say about this particular release, really, is that I'm just glad Glion didn't leave for some ridiculous reason. Y'know, like "Oh, I suddenly, and for no reason, like playing ping pong. BYE." One thing that did bother me about this episode is how non-existent the animation is. Most of the action in this episode takes place in a windy valley, yet you wouldn't know it due to the fact that nobody's hair or clothing seems to be affected by the wind. I realize, of course, that it would have required a lot more time and money to actually animate everything accurately and that it's easier to just have everything not move. But still, it looks like everyone emptied a can of Aqua Net on their heads and dumped an entire container of starch on their clothes before taking to the skies. And while I'm speaking about the wind for a moment; what was up with the Rocket-Dan's balloon being the only aircraft affected by the wind in this episode? Shouldn't Mitsuzoh's balloon and Satoshi-tachi's balloon have been buffeted by the currents as well? The dubbed version has an insert song, something they haven't done for a while. We get a lot more dub background music than we usually do, but I kind of figure we're in for that since we got so much of the Japanese music in the Team Galactic finale. In a way, we're paying for the fact that the dubbers actually did what they should have been doing all along and kept the Japanese music. Gosh we're so lucky. Narrator: "While Dawn's next Pokémon Contest in Daybreak Town awaits, our heroes seem to have gotten a bit turned around and are presently lost in a deep forest." In "Unlocking the Red Chain of Events!" the dub called Asatsuki Town "Daybreak City." But here, it's "Daybreak Town." So I guess, in the dub continuity, Daybreak City got demoted to Daybreak Town sometime after the events of the Team Galactic finale or something? 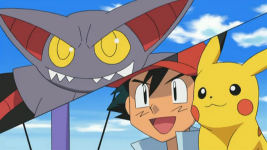 Ash: "Gliscor! That's it! Just keep on chasing after the rope!" Um...Ash? That's not really a rope, now is it? In the Japanese version, the word Satoshi uses is himo (紐). Now the word can be translated into English as "rope," but it could also be translated to "string," "cord," "lace," "band," "line," "lead," or anything else that's long and stringy and billowy like that. Something like "ribbon" would have worked fine. A dissolve is removed between the last shot of Satoshi's second battle and the final scenes of the episode, most likely because of where Cartoon Network placed a commercial break. Instead, the dubbed version fades out from one shot, cuts the actual dissolve, goes to commercial, and then fades in on the scene on the field. The music used for the flashback in the Japanese version is the ending theme to the very first movie, Kaze to Issho ni ("Together with the Wind"). Which is actually pretty amazing since movie ending themes are pretty much never used as insert songs for a number of legal reasons. It begins playing from the moment Mitsuzoh offers to train Glion and lasts until the end of the episode. The dub uses "I'll Always Remember You," one of the ending songs to "The Rise of Darkrai." The song comes in way later than its Japanese counterpart, abruptly starting as soon as the farewell montage begins, and is mostly instrumental. Still, it's an alright song that fits well enough, and I realize that things certainly could have been worse.